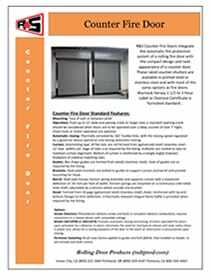 R & S Fire Doors combine the durability, security, efficiency and space saving advantages of a rolling door with the added life and property saving benefits of automatic fire protection. Underwriters Laboratories 3-Hour/Class ‘A’ Label or Oversize Certificate of Compliance is furnished standard. Designed to close automatically from a fully open position. 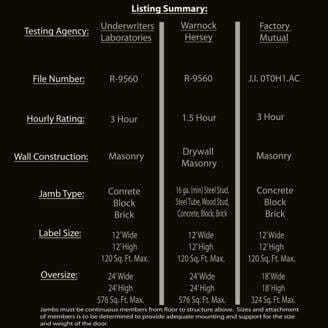 Email us today for more information or a free fire door estimate. 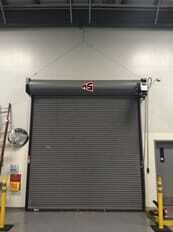 Curtain: Interlocking slats are roll formed from galvanized steel coil. Gage of slats is as required by the listing. Endlocks are riveted to slats to maintain curtain alignment. Bottom of curtain is reinforced by a double steel angle foot piece. Guides: Steel channels or structural steel angles from curtain guides are bolted to structural steel wall angles. Sizes of guides are as required by the listing. Brackets: Steel plate brackets are bolted to wall angles to support curtain and barrel and provide mounting for hood. Hood: Formed from minimum 24 gage galvanized steel sheet, reinforced with top and bottom flanges to limit deflection. A thermally released integral flame baffle is provided when required by the listing. Locking: Chain lock with chain operation and slide bolt locks with push-up or crank operation. Finish: Slats and hoods are pre-finished with a baked on grey polyester primer before forming. Foot piece, guides and brackets receive one coat of rust inhibiting black primer. Optional Voice Board: Can be added to any model, allows a standard audio warning or an optional warning tailored to your specific needs. Smoke Detectors: Photoelectric (detects smoke and heat) or ionization (detects combustion); requires connection to a release device with compatible voltage. Release Devices: Electro-thermal and McCabe links (normally open circuits); electro-magnetic and time delay failsafe releases (normally closed circuits). Model SS90-C Release Device: Provides automatic closing and testing of motor operated fire doors upon activation by a detector or alarm; eliminates the need for mechanical release and reset unless there is power loss; allows for a cycling sequence of the door in the event an obstruction is encountered upon closing. Vibratech: Viscous speed governor patented to allow for a smooth and quiet descent in place of the standard ductile iron governor. Perimeter Gasketing: Brush seals factory applied to guides and foot piece, field installed on header, to aid insmoke and draft control. Vision Lites: Single or multiple 4″ wide cut-outs, glazed with clear wire glass (1 1/2 hour rating. Sloped Foot Piece: For special sill conditions. Cylinder Locks: On Foot Piece.